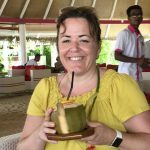 Karen recently enjoyed her first trip to the Maldives to visit the luxury resorts in the Sun Siyam hotel group – Olhuveli Beach Resort & Spa, Sun Aqua Vilu Reef and The Sun Siyam Iru Fushi. Read on to find out about the islands Karen visited or call her on 01752 880880! 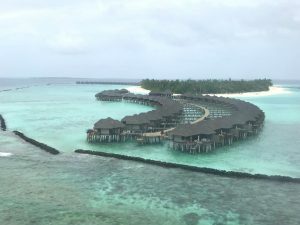 “We flew to the Maldives with Emirates with a short stopover in Dubai, a fantastic journey with excellent service and connections that worked very well. As we approached Male airport I was excited to look out of the window and see tiny islands surrounded by turquoise lagoons and dark blue sea, a quintessential view of the Maldives. On arrival, we walked out of the airport into the arrivals hall – there is a small café here, plus many of the resorts have a desk to assist guests and point you in the right direction. 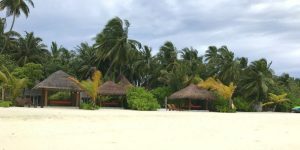 We headed outside to where all the transfer boats were moored, and boarded one which took us to our first destination, Olhuveli Beach Resort & Spa. After about 50 minutes we arrived at Olhuveli, landing at a jetty near the resort’s Dive Centre. 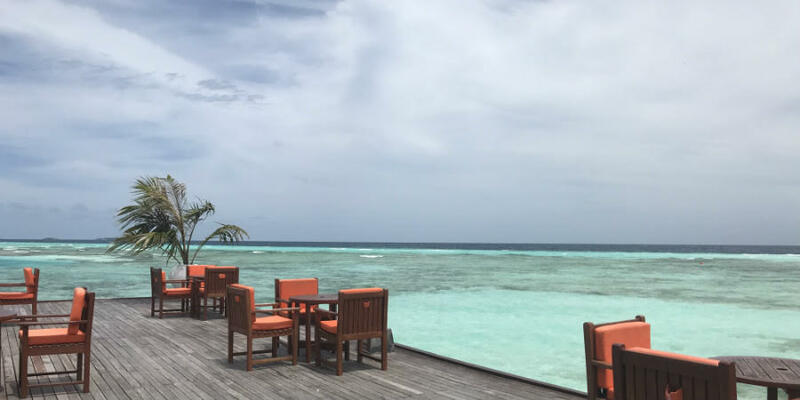 At the end of the jetty is the Lagoon Bar where we enjoyed a welcome drink on the deck overlooking the turquoise water – the perfect welcome to the Maldives. We then headed for lunch at Sunset Restaurant, the island’s main restaurant where a deck hangs out over the lagoon. Buffet meals are included as part of the all-inclusive package with plenty of options to choose from including international dishes- a particular highlight for me was the delicious dessert of chocolate brownie and caramelised bananas! This was followed by a quick trip to the spa where I enjoyed a 15 minute neck and shoulder massage, a complimentary inclusion for all guests which made me feel rejuvenated after the long flight! 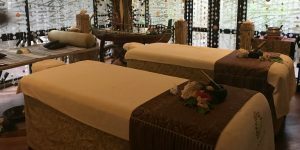 The spa is a lovely facility with secluded treatment rooms hidden away amongst tropical gardens. 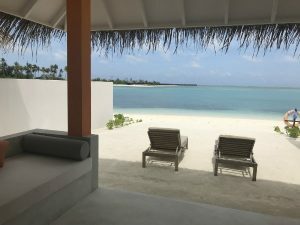 We were then taken to our rooms by golf buggy… I was staying in a Grand Beach Villa on the sunrise side of the island, a light and airy room beside a beautiful stretch of beach with panoramic views over calm waters. I couldn’t wait to get in the sea so headed off to the dive centre to pick up some snorkelling equipment (which I then kept for the duration of my stay) and jumped in for a quick dip! It was then time for a site inspection to look around the resort properly. The island is quite large, with sandy paths leading through the tropical vegetation and wide beaches offering plenty of space to chill out. The island’s colourful accommodation options are spread across the island, located along the beachfront, further back amid the gardens or over the water with either sunrise or sunset views. 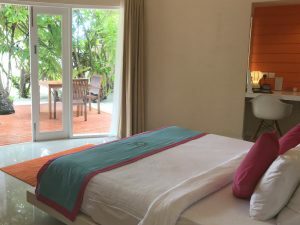 Deluxe Rooms occupy attractive two storey blocks with thatched roofs, set a few steps back from the beach and surrounded by foliage to offer privacy with sun loungers on the sand. All villas are all similar in style and offer, with some beachfront options boasting swimming pools and water villas offering direct access to the turquoise lagoon. 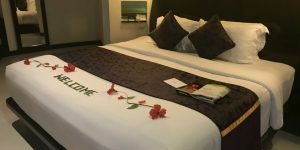 The island is great for families thanks to four pairs of interconnecting Deluxe Rooms and others accommodating families with up to three children in a separate lounge area. The beachfront pool area near Sunrise Bar is a popular spot, with a main swimming pool and a separate children’s pool. 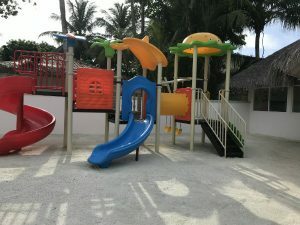 In the centre of the island is an excellent kids club which 3 to 12 year olds can access free of charge, where indoor and outdoor spaces feature thoughtful touches including mini sunbeds by the shallow pool. 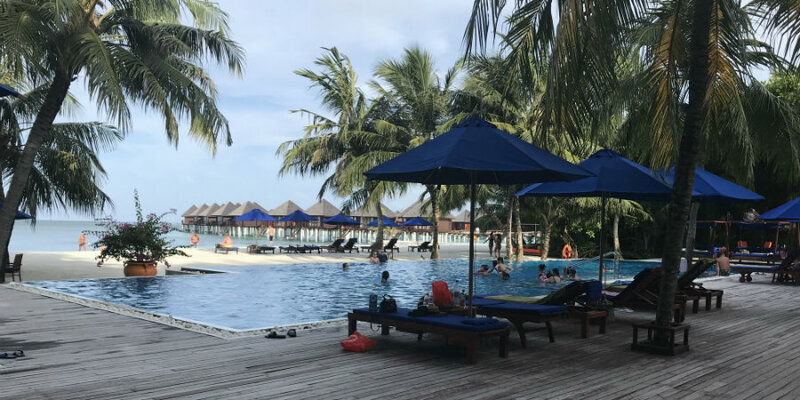 At the southern tip of the island near the water villas is a beautiful infinity pool where a lot of adults spend time during the day and into the evening when the poolside Dhoni Bar offers stunning sunset views. 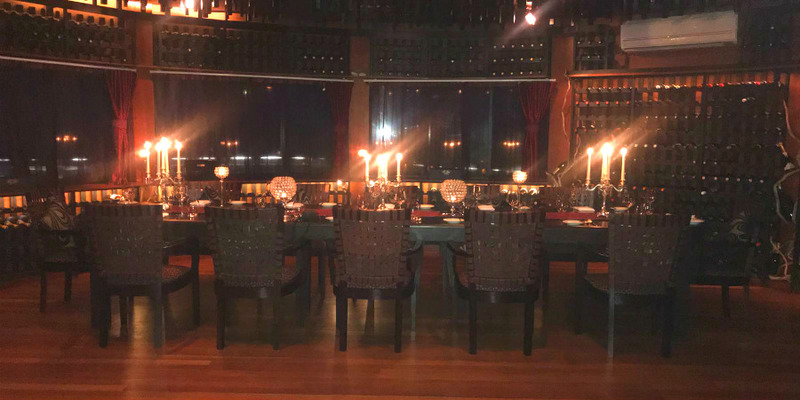 That evening we enjoyed dinner at Four Spices, an a la carte restaurant serving fantastic Asian cuisine in a spectacular overwater setting where guests have a US$25 meal credit as part of the all-inclusive package. We then headed along to the manta view point at the end of the main pier – unfortunately we didn’t spot any manta rays but it was a lovely to spend some time dangling our feet over the edge and watching the fish! 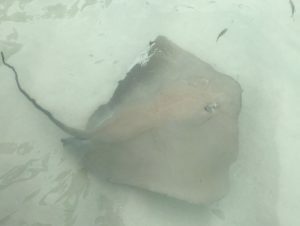 The following morning we ate breakfast then went snorkelling off the end of the main pier in front of the dive centre – it was great fun to swim through shoals of fish over the house reef, and I was delighted to be able to capture the fabulous marine life on an underwater camera! 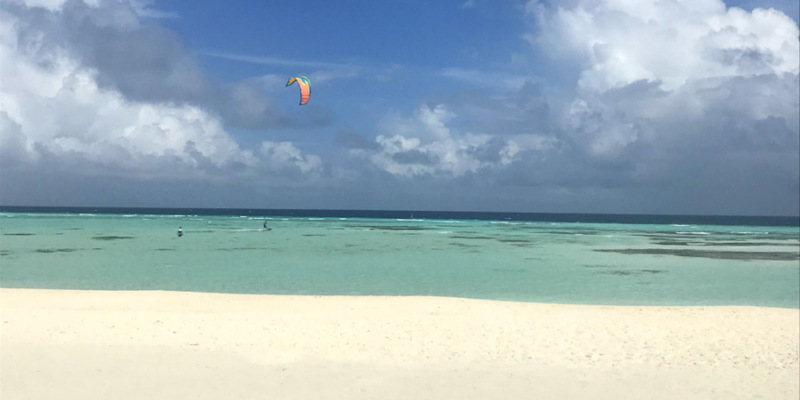 There are plenty of other leisure activities available at Olhuveli including kayaking, windsurfing, kitesurfing and tennis, many of which are included in the all-inclusive package – you certainly wouldn’t get bored while staying here. 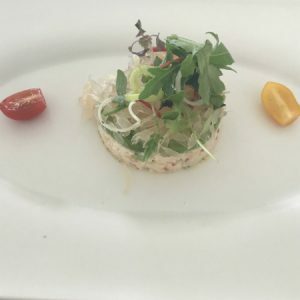 We ate lunch at Lagoon Restaurant, where guests can use a US$20 meal credit at lunch or enjoy a 5 course set menu in the evening. 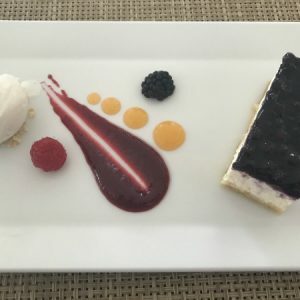 I had a delicious a la carte meal of crab salad followed by fresh tuna and blueberry cheesecake – a lovely lunch in a fantastic waterfront setting. I spent the rest of the afternoon exploring the island, relaxing in my room, snorkelling in the crystal clear lagoon and sipping on cocktails. Dinner that evening was at Sunset Restaurant, where the extensive buffet was split into sections with live cooking stations and plenty of fresh produce – I was really impressed by the restaurant’s fantastic selection and intimate feel. We then headed to Lagoon Bar to experience some of the resort’s regular entertainment – it was great to see so many families getting involved with the weekly Crab Racing event, while there was a fantastic atmosphere at the DJ party. After breakfast we packed up and left Olhuveli Beach Resort & Spa to board a speedboat back to Male airport. 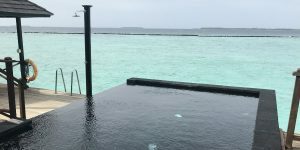 We had time to experience the exclusive seaplane lounge at Male airport, where guests staying at Sun Aqua Vilu Reef and The Sun Siyam Iru Fushi can enjoy amenities including comfortable seating, showers and free snacks when they arrive in the Maldives. 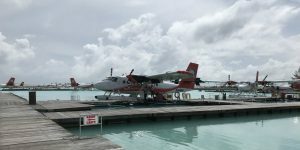 We then boarded our seaplane to travel to Sun Aqua Vilu Reef, a flight of about 45 minutes. 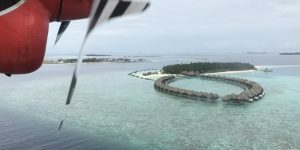 This was my first time on a seaplane and I was left speechless by the spectacular views we witnessed along the way, with barefoot pilots just a few feet away in an open cockpit– a fantastic experience. 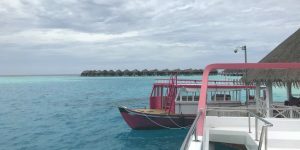 We approached the island by the water villas and landed in the sea, disembarking onto a pontoon then boarding a dhoni for the short trip across to the island. We were greeted by drummers and offered a fresh coconut to drink while we completed check-in formalities in the sand-floored Nautilus Bar, before being shown to our rooms. 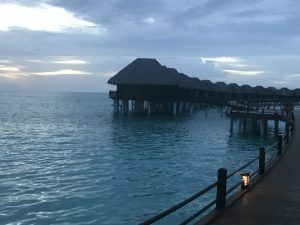 I was lucky to be staying in one of the luxurious Aqua Suites, set on stilts over the lagoon near the tip of the water villa jetty with sunset views. Boasting a spacious bedroom, separate living area, dressing room, bathroom with views out to sea and a large outdoor deck with a beautiful infinity pool, this is a fantastic option for romantic getaways. There is plenty of space to relax both indoors and outdoors, plus you can snorkel and swim in the lagoon thanks to steps leading down from the deck. After settling in we headed to The Aqua for lunch, the resort’s main buffet restaurant where all meals are taken as part of the all-inclusive package. I then headed to the Sun Aqua Spa where I enjoyed a fantastic 60 minute Balinese massage – the spa itself is a peaceful and relaxing venue with open-air treatment rooms and additional facilities including a Jacuzzi and steam room, or for added indulgence guests can opt to have their treatment on the beach or in their villa. A wonderful way to while away a few hours, even for someone like me who usually doesn’t like to sit still for too long! We then set off on a tour of the lush island which is smaller in size than Olhuveli. 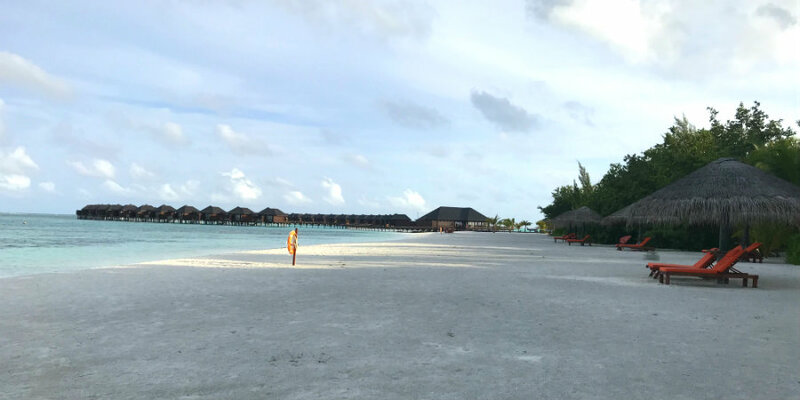 As well as plenty of greenery across the island, there are beautiful wide beaches on the sunset side where many of the main facilities are located as well as the pool villas. Most of the other beach villas are found on the sunrise side of the island, where guests can access the excellent reef which is found just offshore –swim out through the protected lagoon then snorkel with the current to the tip of the island. I really liked the resort’s bright land-based villas, all offering the same layout inside but different amenities outside – Beach Villas have a beachfront terrace with sun loungers, Deluxe Beach Villas also have a Maldivian-style swing on the sand, while the most luxurious options also have an infinity pool with views over the lagoon. 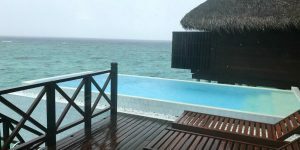 The water villas offer sviltunning sea views with facilities including an overwater hammock in the Aqua Villas, a large pool in the Sun Aqua Pool Villas. 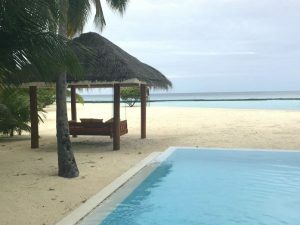 Vilu Reef’s main swimming pool is a pretty setting sandwiched between The Aqua and two of the island’s other dining venues, Positive Energy and Island Pizza – a lovely spot to spend the day with cocktails delivered straight to your lounger! Turtle Kidz Club is found nearby, another impressive facility with indoor and outdoor play areas as well as a shallow pool for youngsters. After our island tour we headed to the Nautilus Bar to watch stingrays being fed in the water below us. Sitting on the deck sipping cocktails was a lovely way to spend time before dinner at The Well Done, where we enjoyed an amazing meal with our feet in the sand. 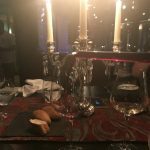 The menu was phenomenal, featuring delicious fresh tuna, wagyu beef and an impressive chocolate dessert hidden beneath a melting chocolate dome, prepared by the enthusiastic Denzil who trained with Michelin-starred chefs! Dining at The Well Done is not included in the all-inclusive package, but I would recommend that guests visit at least once during their stay. 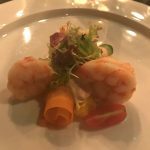 The Well Done also hosts themed evenings including a Lobster & Champagne Barbeque, where all-inclusive guests receive a meal credit towards the cost of their meal. 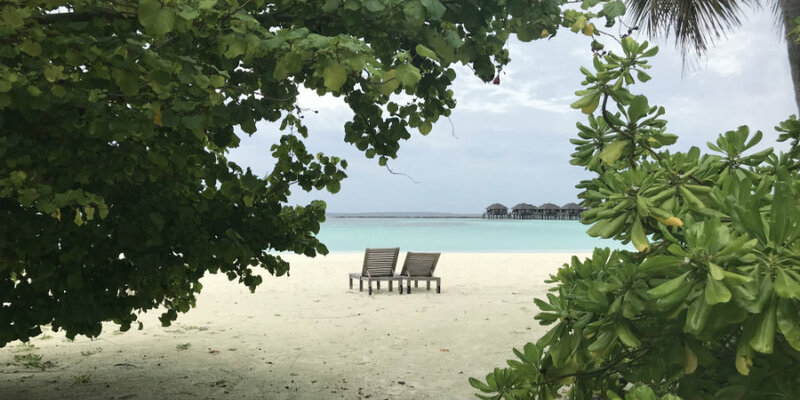 The next day was mostly spent relaxing on the island, apart from a quick boat trip to the farm island where much of Vilu Reef’s produce comes from, as well as to a new resort that is being built on a nearby island – soon to be a new addition to the Sun Siyam hotel group! 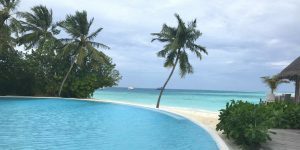 I spent a lot of time making the most of my fabulous Aqua Suite including my private infinity pool, venturing away to wander around the island and snorkel on the house reef. I was very impressed by the reef, where there was lots to see including an abundance of tropical fish. To my delight, I also noticed dolphins playing about 20 metres away from me in the lagoon – I was only disappointed that I didn’t have a camera at that point! Other water sports available on the island include windsurfing and jet skiing, while there is also a tennis court and badminton court – plenty to occupy active guests! 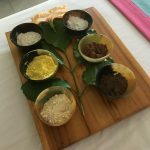 We ate all our meals at The Aqua, the resort’s main buffet restaurant where there is plenty of choice including live cooking stations offering Asian and international cuisine. The following morning it was time to leave Vilu Reef, so we boarded a seaplane back to Male then another on to The Sun Siyam Iru Fushi. 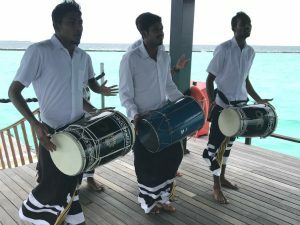 We were met on the arrival platform by traditional Maldivian drummers and our personal butlers offering Champagne. Each villa has a private butler who caters to guests’ needs throughout their stay and provides an introduction to the resort on arrival, explaining everything from the activities on offer to the dining options available. Our first stop was Bamboo Restaurant, where we enjoyed delicious Asian cuisine on a terrace by the beach. A selection of dishes are included in the all-inclusive package, while a larger a la carte menu is available at an extra cost for all guests – I chose Tom Yum soup followed by Thai Red Curry, both on the all-inclusive menu, accompanied by a delicious mojito! Lunch was followed by a tour of the island, which felt larger than both the others I had visited with buggies driving around to pick up guests if required. The resort has fantastic leisure facilities, many of which are located amid the tropical vegetation in the centre of the island, including a tennis court, a well-equipped gym and a games room with snooker and table tennis tables. The water sports centre offers everything from waterskiing to kitesurfing, also allowing guests to borrow kayaking and windsurfing equipment for an hour each day free of charge. Guests can also use snorkelling equipment whenever they please, allowing them to explore the coral garden which is a shallow, sheltered area just offshore. A weekly activity programme includes complimentary and chargeable activities every day including cooking classes, nature walks and sunset cruises as well as evening entertainment. 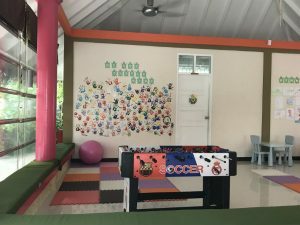 As with the other resorts I had visited, there was an impressive and very well equipped kids club with plenty of indoor and outdoor spaces which are appropriate for children of different ages. A family-friendly swimming pool is overlooked by Fluid Bar, which transforms to become Taste of India by night, while a stunning adults-only infinity pool is located at the opposite end of the island. Accommodation at Iru Fushi is stylish and indulgent, with all villas featuring luxurious amenities such as Jacuzzi bathtubs. 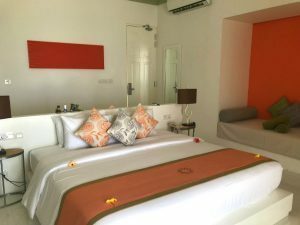 Most beach villas feature the same interior layout and spacious open air bathroom, with additional amenities outside for higher room categories such as a beach cabana and private swimming pool. Beach villas are grouped together in horseshoe shapes, hidden among the undergrowth to ensure privacy with varying views of the lagoon as some are set further back than others. 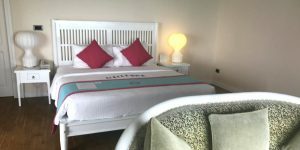 I was staying in a Deluxe Beach Villa with Pool, where a terrace and private sandy area surrounded the beautiful pool with the beach a few steps away through the tropical vegetation. Water villas are equally luxurious, all with wooden decks and glass panels in the floor which offer a glimpse of the lagoon below. Horizon Water Villas also have a hot tub while the beautiful Infinity Water Villas have a separate lounge area and a private infinity pool. 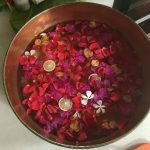 We then headed to the Thalgo Spa, where I had a fabulous massage in one of the 20 treatment rooms which are scented by flowers. After their treatment, guests are welcome to enjoy some relaxation time the tranquil spa, where there is a hydrotherapy area including steam room, sauna and plunge pools. 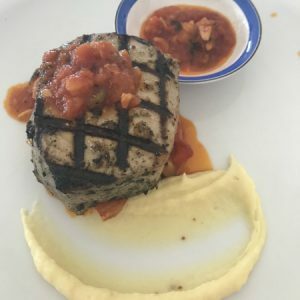 That evening I felt completely rejuvenated as I headed to the Islander’s Grill, where I enjoyed a delicious meal with plenty of fresh fish. Set beside the infinity pool with tables right on the sand, this is a stunning setting for dinner where guests staying on an all-inclusive basis can choose from a special a la carte menu. The next morning, after a buffet breakfast at the beachside Sinbad Restaurant we headed off on a snorkelling trip to a nearby reef where we saw plenty of tropical fish and massive coral. Back on the island we ate lunch at Fluid, another a la carte restaurant where guests can dine as part of the all-inclusive package. 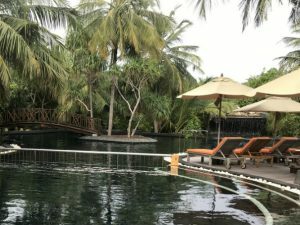 This was followed by an afternoon at leisure, when I took the opportunity to spend some time relaxing in my villa then explore the island further. The island is very well established with lots of plants providing privacy for all villas. The island feels spacious but it took just 30 minutes to walk almost the entire circumference – it’s not possible to walk along the stretch of sand in front of the Celebrity Retreat, the island’s most exclusive accommodation option. That evening we headed to Flavours Restaurant, where we sat on the deck to feed reef sharks before heading to the wine cellar for dinner. 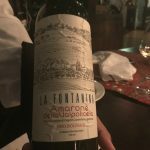 We enjoyed a phenomenal meal of beautifully presented dishes accompanied by fine Italian wine, a fantastic private dining experience which I would highly recommend for special occasions! The following day it was unfortunately time to leave the Maldives… A very smooth homeward journey started with a seaplane flight back to Male airport where we had a quick look around the cafes and shops before boarding our flight back to the UK, stopping off in Dubai for a few hours. I had a fantastic time in the Maldives and definitely hope to return one day! Call Karen on 01752 880 880 to hear more about her trip to the Maldives!